(Na‘alehu) – It took a few months to celebrate the milestone, but last night staff and dozens of volunteers for the Hawai‘i Wildlife Fund (HWF) marked reaching 250-tons of marine debris collection just off Hawai‘i island. The group also received a DLNR & You Citizen Conservationists Award in recognition of their efforts. 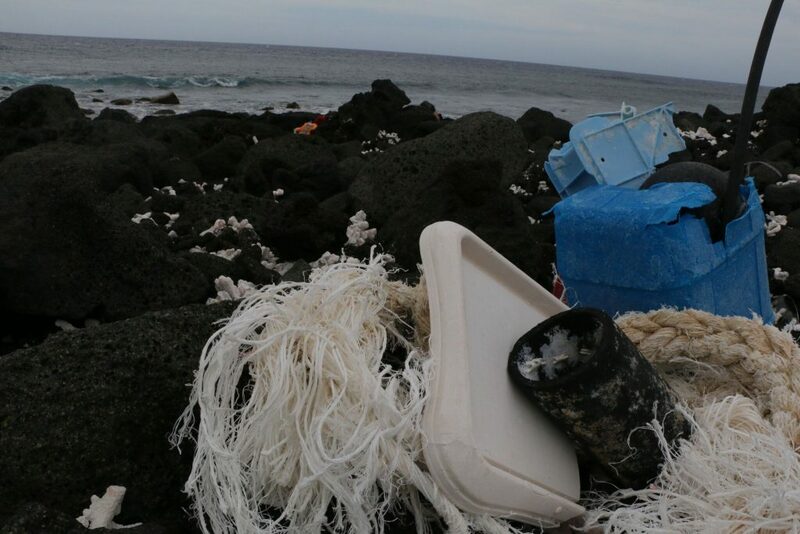 Since last October HWF has added to its tonnage tally, now having collected more than 515,000 pounds of marine debris on Hawai‘Ii island and even more if you include collections on Maui, Midway Atoll and French Frigate Shoals. It’s a never-ending project, according to Hawai‘i Wildlife Fund Program Director Megan Lamson. She explained, “It’s hard to envision 250 tons of marine debris. But if you can picture the largest trucks possible and fill 250 of them to the brim with plastics, nets, and all the other stuff that washes onto the reefs and onto shore, you get an idea of the scope of our efforts.” The group relies heavily on volunteers, many of whom were recognized at Saturday’s celebration. Over the past decade, HWF reports more than 43 thousand hours of volunteer time has been dedicated to beach clean ups and debris removal. A good example of their good work is what happened a year ago at Kamilo Beach. An enormous tangled ball of discarded fishing net washed onto the reef just off shore. Before it could be recovered vandals lit it on fire. Typically, HWF staff and volunteers spend hours cutting through the tough netting to reduce it to manageable lengths to haul to shore. It’s then loaded into pick-up trucks and taken to a rubbish transfer station. From there, the mass of netting is shipped to O‘ahu where it contributes to fueling the H-Power plant which produces electricity for the island. Every year, for a decade or more, HWF has provided manpower and support for a major beach clean-up along the coastal section of the Manukā Natural Area Reserve, the largest in the State of Hawai‘i’s Natural Area Reserve System. The work is tough and normally occurs in hot and dry conditions, which is further testament to the dedication of the organization and its volunteers. Lamson said when the Hawai‘i Wildlife Fund started in 1996, the organization’s co-founder Bill Gilmartin was often told, “why bother, debris is just going to keep coming ashore.” At that point the plastic debris at Kamilo Beach was shoulder-high which gave it its moniker of plastic beach. Undaunted, HWF, through its educational efforts with school groups and other organizations has made a huge difference in the appearance of the coastlines where it works and more importantly in helping keep debris from washing back into the ocean where mammals and other aquatic creatures often get entangled in derelict netting. In recognizing HWF with a DLNR & You Citizen Conservationists Award, DLNR noted that the group and its passionate and dedicated volunteers go way beyond any call of duty to help protect, preserve, and repair Hawai‘i’s natural and cultural resources.